Perhaps the most difficult thing when buying a guitar for your child is handing over a wad of hard-earned cash and not being sure whether they’ll stick at it! Which is why it’s a relief that some super-budget electric guitars for kids, like the Rogue Rocketeer RR50, exist. On most marketplaces this guitar is priced at well-under one hundred bucks, so it’s relatively risk-free without compromising on style. Let’s check it out. Rogue are no big name in the world of music, but their instruments still look, feel and sound like guitars – these are no toys. The Rocketeer RR50 features a short 7/8 scale (that’s a 23.25” scale length) body made from solid basswood, with an attractive curvy double-cutaway shape allowing access to all the frets. This body comes in a choice of colors, which are pretty much all variations of red – there’s a simple red, a red burst, a wine burst, and a solid black on offer. Whatever color the body, all feature a bolt-on maple neck, with a truss-rod, a rosewood fretboard and 22 frets. For children it should be a comfortable little guitar to practice on and feels pretty solid. Out of the box it’s playable, however – as you may expect from a mass-produced budget guitar – it’s not flawless, and a good set-up from your local pro would certainly enhance its playability. Make no mistakes, the Rocketeer RR50 is very basic in terms of hardware – what you get is what you need, and no more. When it comes to electronics the guitar is fitted with one humbucker at the neck, so there’s no need for a pickup selector switch. There are no tone controls either, however you will find a convenient master volume control knob on the lower bout of the body. There’s a set of chrome tuners in a 6-in-line configuration on the headstock, which hold tunings relatively well – at least when compared to some other entry-level guitars. The bridge is fixed (so there’s no tremolo bar) with adjustable saddles and a string-through tailpiece. Finally the guitar comes with a very simple but functional gig bag, which is great for transporting it to and from lessons. With the single passive humbucker there’s little chance of much versatility in sound, and the tone can only be controlled via whatever amp it’s plugged into. However the Rocketeer RR50 does its job in giving your youngster a voice. It is clear and articulate, and allows for some good rock overdrive when plugged into a capable amplifier. We’ve established that the Rogue Rocketeer RR50 lacks luxury of any kind, but – at well under $100 – luxury is not what you’re looking for. 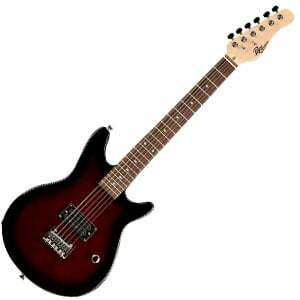 What is on offer is a stylish, sturdy and simple electric guitar that kids can pick up and play with minimal fuss. After a good set up, it plays nicely, sounds clear and would be a great companion for any child taking their first steps on the guitar. For more info about the Rogue Rocketeer RR50, click here. For more guitars for kids, click here. I have played 2 hour gigs with this guitar. It’s a pro guitar for me. Great set it and forget it tone. Plays great through PA with Joyo British.